GORKHA, Nov 23: Quake victims in Gorkha district are having tough time due to the increasing cold with the winter fast approaching. Hundreds of them are still living under tarpaulins and makeshift shelters set up after the quake destroyed their houses some 19 months ago. The catastrophic quake of April 25 and its subsequent aftershocks had caused damages to about 60,000 houses in the epicenter district alone. Only about 20 percent of them have managed to build permanent houses that can provide them proper shelter in the biting cold weather, according to District Disaster Relief Committee (DDRC), Gorkha. Cold weather has already gripped settlements especially in the northern areas of the district. 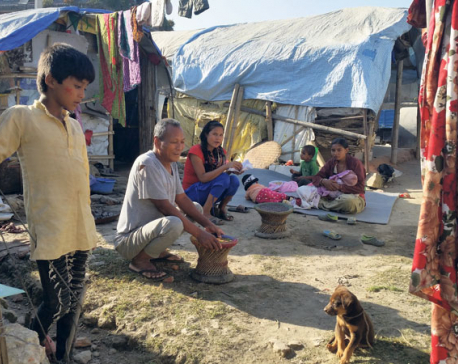 Those rural settlements in the north still have not begun house reconstruction and are still surviving under tents and temporary sheds, according to Raj Gurung, a local of Laprak. "Settlements of the north have cold weather even during summer. And the winter days are unbearably cold, especially when having to live without proper shelter," he added. Quake victims are unable to get proper sleep at night due to dewdrops from the roof and the biting cold. Kumari Sunar of Barpak-4, who has been living under tarpaulins since the earthquakes, said she is very worried about the health of her children. "Apart from bed sheets and some clothes as relief, we have nothing else. Apart from some warmth during daylight, our shelter is always freezing cold." Jeet Kumari Gale of Barpak-4, a mother of two children, shares a similar plight. Her family of four members has been unable to reconstruct their destroyed house due to poor financial condition. Apart from those affected by Budigandaki Project, most of the quake victims in Gorkha have already received Rs 50,000 grant, the first tranche of the reconstruction aid. However, many of them still have not begun their reconstruction due to insufficient fund. Lack of technicians in villages, problems in transportation of construction materials along with other problems have hindered their reconstruction efforts. "How can we construct quake-resistant house with Rs 50,000? We spend our mornings and nights shivering in the biting cold. Nobody understands our problem and we are left frozen to death," said Man Kumari Gurung of Saurpani-8. 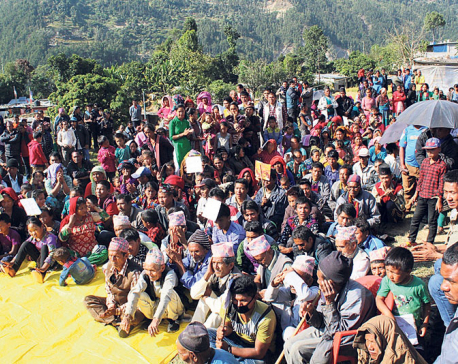 Many quake victims in the district have demanded that the government should provide the quake grant in lump sum instead of multiple installments, according to Lal Prasad Bhattarai, VDC secretary of Chhaikampar.